It’s finally cookie baking season! Tell me, are you as excited about the next few weeks as I am? Vander is just starting to help me in the kitchen and I can’t wait to have his sweet, chunky little hands all over my cookie-dough batter. I apologize in advance if you get any cookies from me, but I pinkie-promise that we’ve triple-washed our hands. I’ve mentioned this several times, but I’m actually not much of a baker. I much prefer to cook than to bake. Baking takes precision and patience, two traits that don’t come naturally to me. However, that all goes out the window the moment there is a chill in the air. I want hot cocoa, I want rolled-out sugar cookies and I want to spend hours on a Saturday in my kitchen baking. 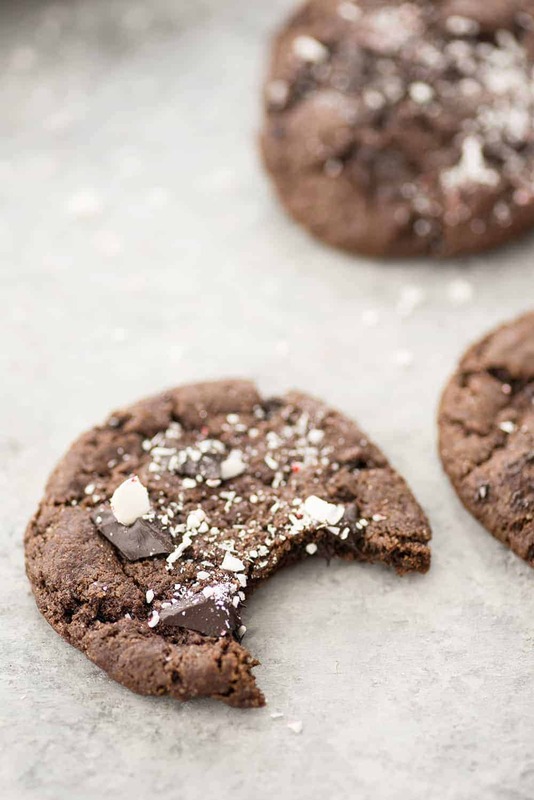 I can’t even explain to you how mind-blowing these chocolate peppermint cookies are. 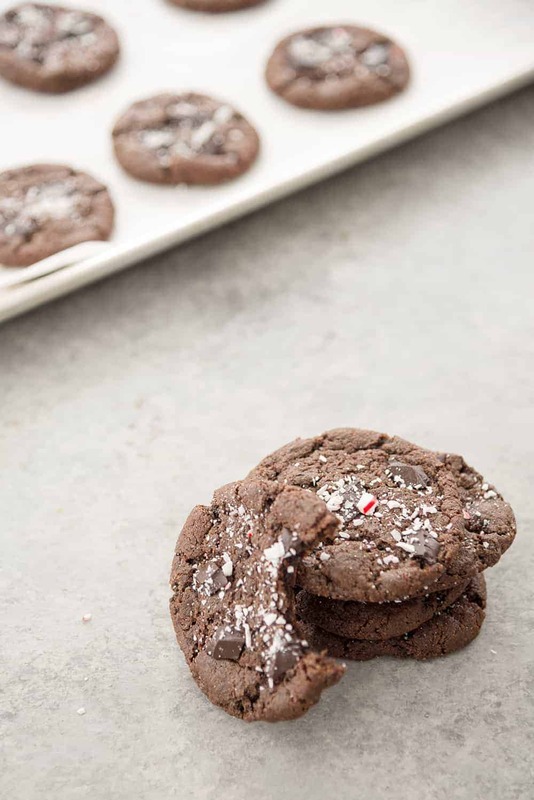 Perfectly crinkled, chewy double chocolate cookies with a hint of peppermint. I first tested this recipe back in August and have been making a batch monthly ever since. Since I’ve got now little hands in the kitchen with me, I want to up my arsenal of vegan cookies. When he’s grabbing a handful of dough and shoving it in his mouth, the last thing I want to worry about is raw egg. So these vegan cookies are coming to you today and I hope to finish a few others I’m working on before Christmas. These cookies couldn’t be simpler to put together. Mix the dry, mix the wet, add in chocolate chunks and bake. 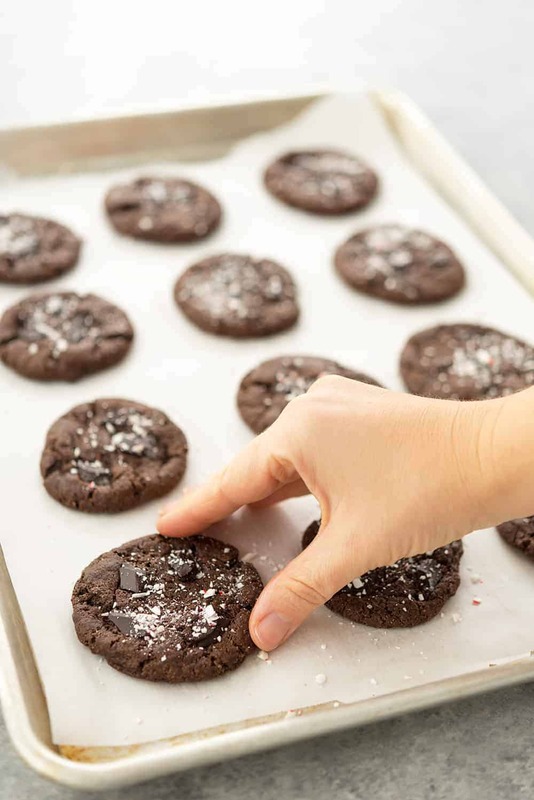 The moment they come out of the oven, sprinkle on finely crushed candy canes. I’ve recently started to sift my flour/baking soda/powder together for baking and it’s a GAME CHANGER. Trust me, I’m the laziest person ever when it comes to cooking (see why I like to cook and not bake) but this extra step is really worth it. 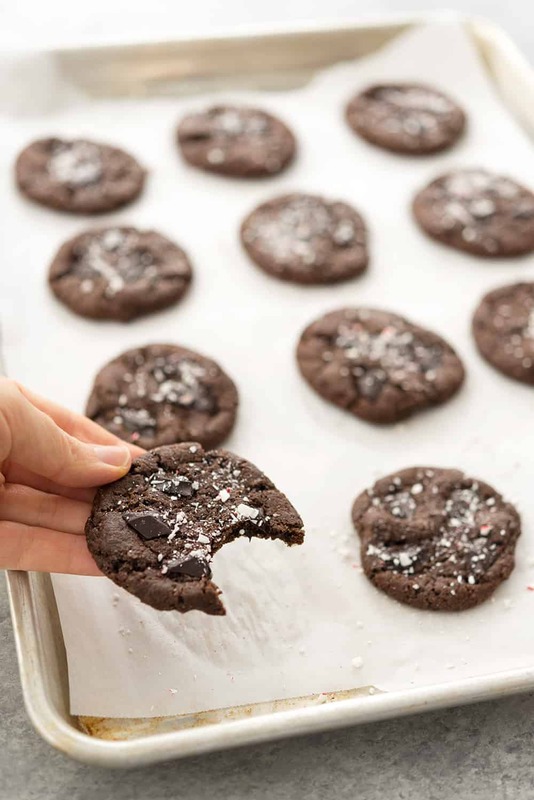 When I don’t sift beforehand, I notice that my cookies are more dense and I occasionally get a bite of baking powder if it hasn’t been mixed into the batter fully. To make this a 60-second or less move, just add everything into a fine mesh sifter then pat your hand on the side. 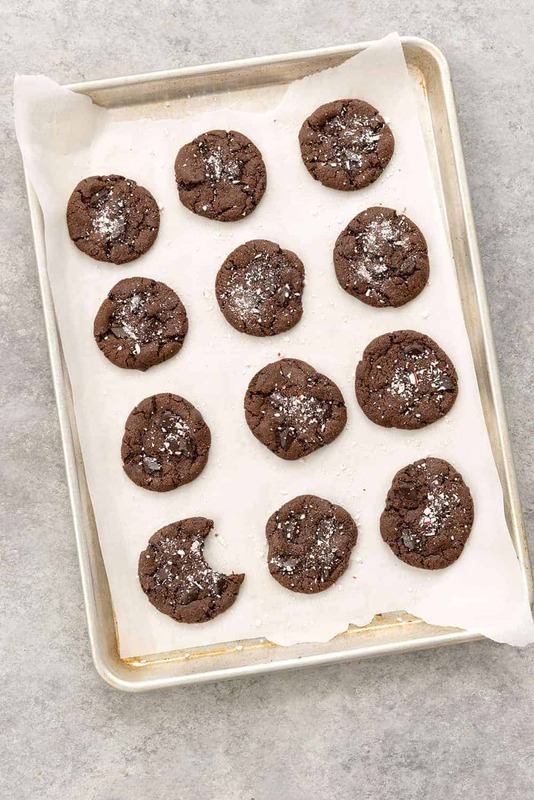 The ingredients will fall like snow into your bowl, creating perfectly even cookies once they bake. Just do it. 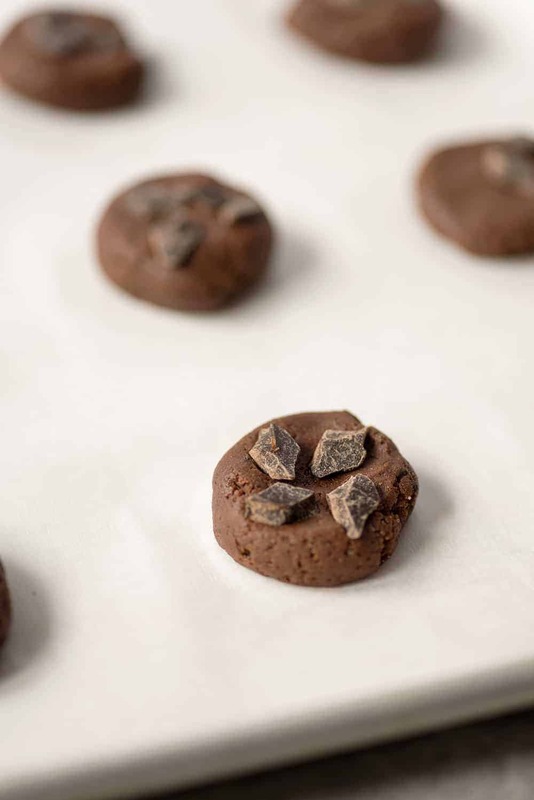 It’s fairly easy to find vegan chocolate chips these days, but you can also use regular chocolate chips if you like. Lastly, I’m calling for Earth Balance baking sticks here because I love them and use them all the time to create vegan cookies. Coconut oil sticks won’t work the same way. Earth Balance is essentially margarine without any trans fats. Again, you can make these non-vegan by using regular butter. Earth balance is slightly salty, so I omit added salt when I use EB. Ready, set, bake! Let me know what you think about these! What cookies are you making this year? 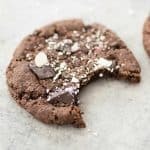 Vegan Chocolate Peppermint Cookies! These are the PERFECT cookie for your holiday gift exchange! 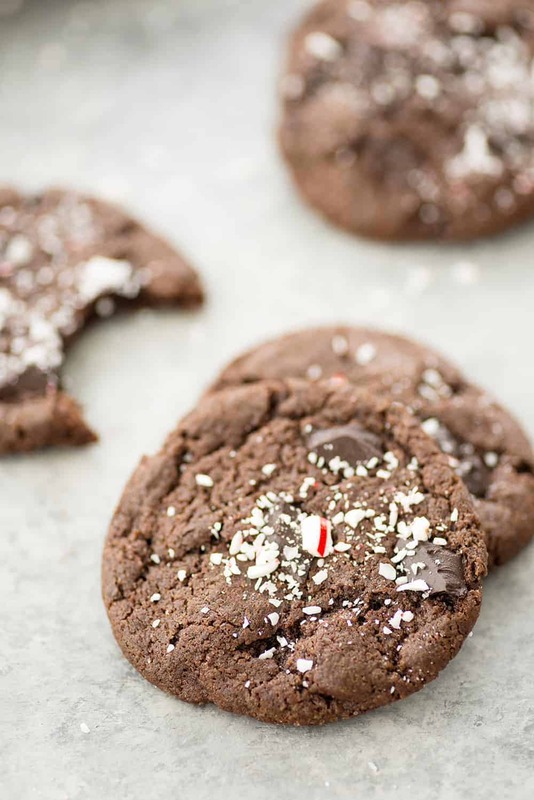 Vegan chocolate peppermint cookies with crushed candy canes on top. Easy to make, no cutting or rolling required! Add the butter and both sugars to a stand mixer fitted with a paddle or to a bowl and using an electric mixer. Cream together, then add in the vanilla and peppermint extracts and stir. In a separate bowl, sift together the flour, cocoa powder, baking soda and salt, if using, together. Add the dry ingredients to the wet, then mix together until combined. Add in the chocolate chips and mix in. Add in the milk 1 tablespoon at a time until a thick dough forms. Be careful not to add too much milk, the dough will be very thick, but sticky enough to roll into balls. Roll into small bowls (I use a 1-tablespoon scoop) and space evenly on a baking sheet lined with either a silpat or parchment paper. Gently press down the balls, and top with a few extra chocolate chips. Bake for 10 minutes. The edges will be firm but the cookies will still be soft in the middle. They will firm up as they cool. Remove from the oven and immediately sprinkle with crushed candy canes. Let the cookies sit on the cookie sheet for 5 minutes, then remove to a cooling rack. These will keep for 3-4 days on the counter and 2-3 weeks in the freezer! Sifting the cocoa powder and flour together is really important so the flour and cocoa doesn’t clump together. I use a sieve to quickly sift all of the powder/flour together. Hi, Alex, I am so excited to see vegan cookie recipes on your blog as I bake and send every Christmas to my vegan niece and this will be a nice addition. I like to have vegan recipes for myself as well. However I can only find Earth Balance in the tubs and wonder if you think that is ok for baking. I have used it in other cookie recipes and seems ok, at least most of the time. Thanks, and I look forward to some more vegan cookie options! Hi Susan, I don’t see why the tub wouldn’t work! I’ve used that in a pinch for baking, and the recipes come out well.